"Yes, that's 154B - as in Billion. It was done entirely with AMD hardware, and involved 9x6990, 4x6970, 4x5870, 2x5970, and 1x7970 - for a total of 31 GPU cores in 6 physical systems." BitWeasil posted. 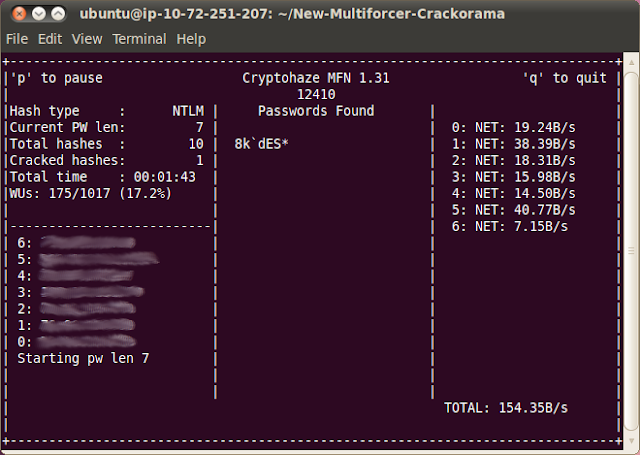 WebTables is a new rainbow table technology that eliminates the need to download rainbow tables before using them, and the new Cryptohaze Multiforcer is an open source, GPLv2, network enabled platform for password cracking that is easy to extend with new algorithms for specific targets. The latest version of the Cryptohaze Multiforcer can be download from here.